A cross stitch stamped sampler sewn in larger cross stitch for our Beginner Series with a house , a green lawn and a willow tree,featuring an unusual blending of colors and borders all on a natural linen. An easy to sew craft kit,which will give one instant delight and easy to execute, with outstanding results. I just started this one; the fabric and color combinations are wonderful; It is fun/easy to sew and looks like I've labored for days and months!!! Great quality; Great price as are all of the items that I have bought from Country Stitching. I have almost completed this sampler and it is so beautiful. It cannot compare to the picture. The colors are vivid. Although it is very easy to stitch the pattern appears very intricate and advanced. 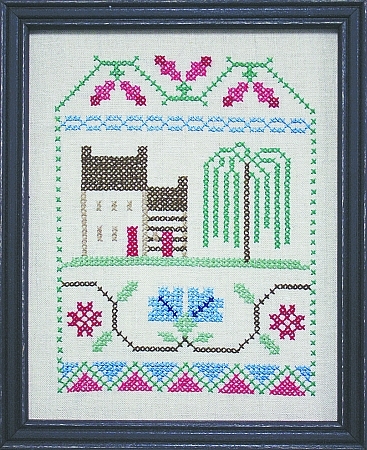 I love this piece and I highly recommend making this sampler. Willow is proving to be so much fun! Nice to do an easy one as I can watch tv while sewing. It is turning out to be quite beautiful! Very nice simple cross-stitch, fast to do. Using it as for a wedding announcement. Quick and easily completed..........LOVE IT!!!!!!!!! !